It’s single digits and with the wind, we’re hitting negative temperatures. I know, I know. I live in New England, I did it to myself. I like it here, but living here for about five years doesn’t make it easier dealing with the snow, the bitter cold or plastic wrapping my windows. Yes, for those in warm weather – plastic sealing your windows can help keep the draft out. One thing that has been helping us this fall and into the winter has been making soup and chili. Our rotation has been ground turkey chili, white chicken breast chili and broccoli cheddar soup with the latter being added to the recipe collection this season. 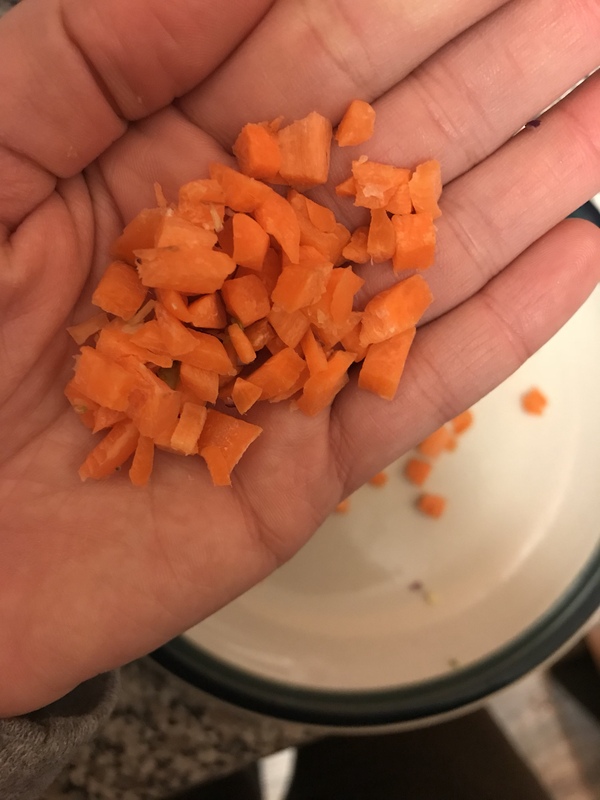 We’ve buy a lot of vegetables in bulk from BJ’s whole sale, we also go to you-pick places in the summer and I’ve been trying to utilize as much of the veggies and fruit as possible. 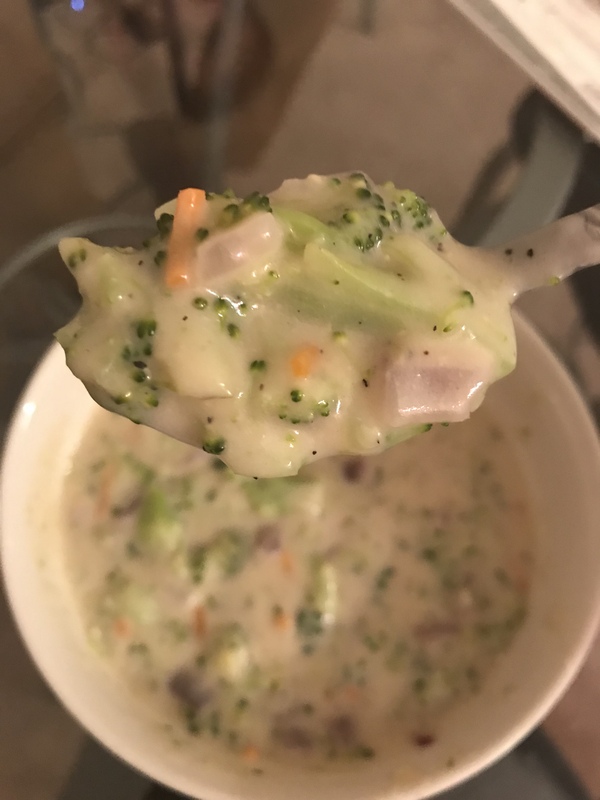 Broccoli cheddar soup is one of the recipes that allows me to use all the parts of broccoli without waste. To me, at least, the stalk is usually a little bitter and needs to roast a lot longer than florets do, however, in this soup all parts continue to cook down and there’s no lack of flavor. Back in the day, I could easily consume a bread with broccoli cheddar soup from Panera, however, that was before my diet changed and before my digestion system changed. If you’re someone like me who experiences lactose intolerance to things like cheesecake, soft serve ice-cream or heavy whipping cream, but can handle hard cheeses or goat products – this recipe will be for you. 1.Pre-heat oven to 375 degrees. 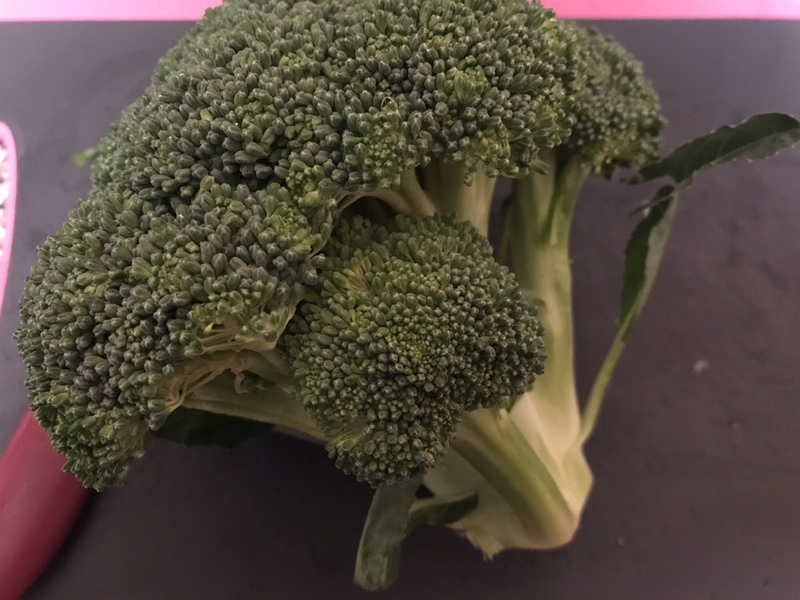 2.Chop broccoli into 1 to 2 inch pieces include both florets and stalk in using a crown, if you using pre-cut florets cut florets into smaller pieces suitable for roasting. 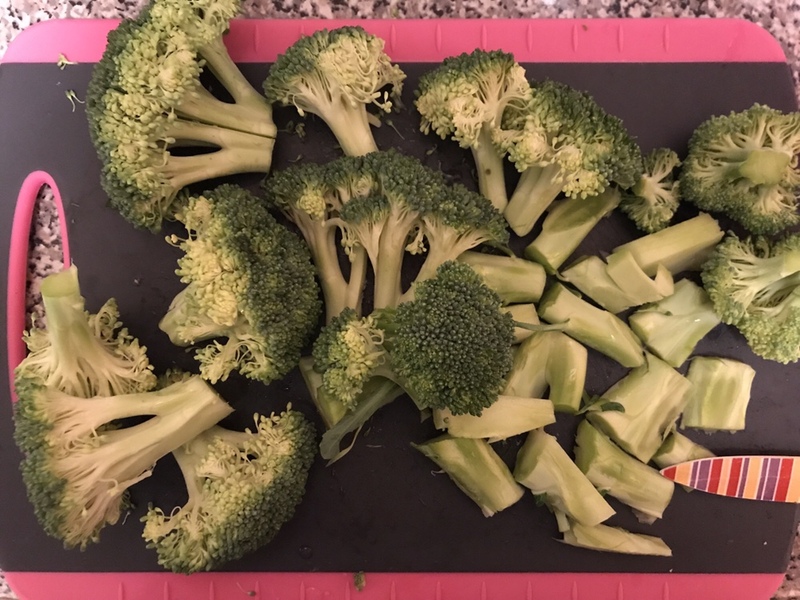 3.Spray a baking sheet with non-stick spray and spread out broccoli pieces so that they lay flat and aren’t piled on each other. Spray broccoli with cooking spray. If you prefer to cook with oil, use about a table spoon of olive oil to toss the broccoli in before laying it on the greased baking sheet. 4.Bake broccoli for about 15 to 20 minutes (this is the longest part of this recipe). 5.While broccoli is baking, peel and chop the red onion and dice the carrots. These pieces should be small. 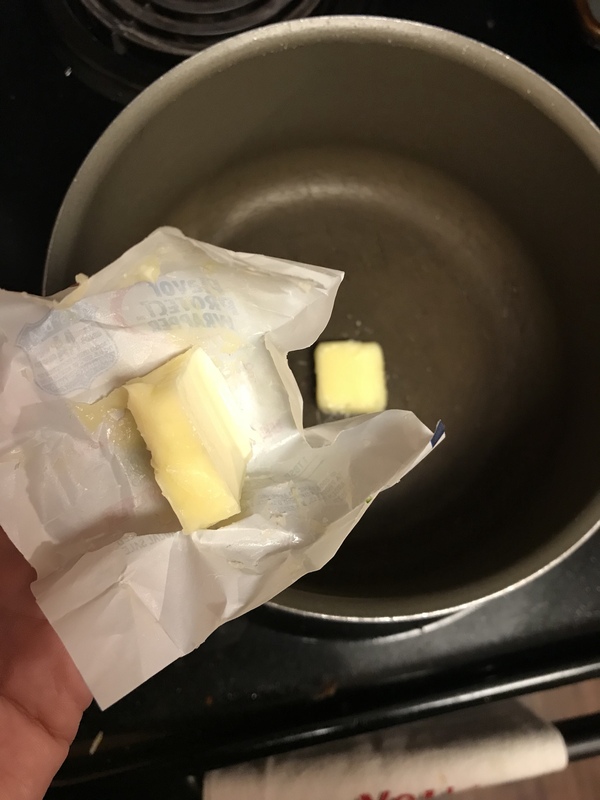 6.In a medium pot, melt 1 tablespoon of butter and add chopped onion. 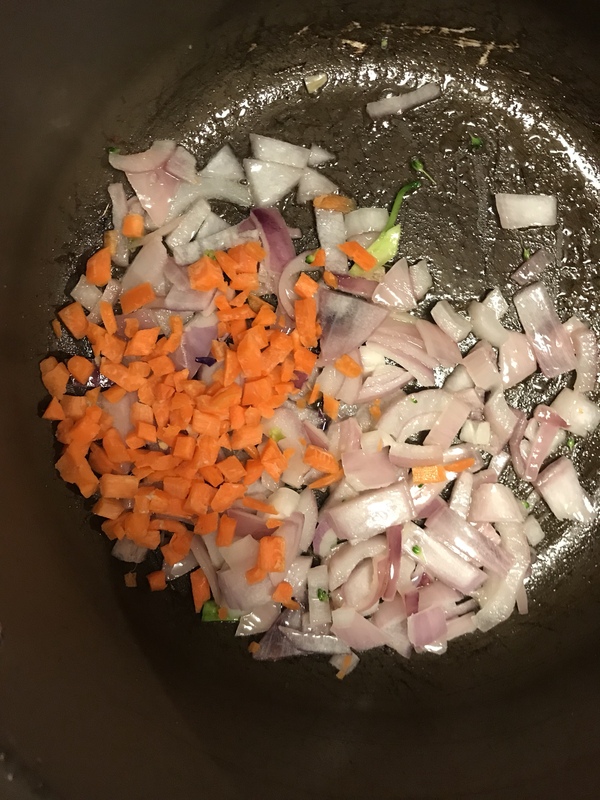 If you want your carrots a little softer, you can add them with the onion at this step. Let vegetables simmer for a few minutes until onions become more translucent. 7.Add 1 and 1/3 cup of milk alternative. 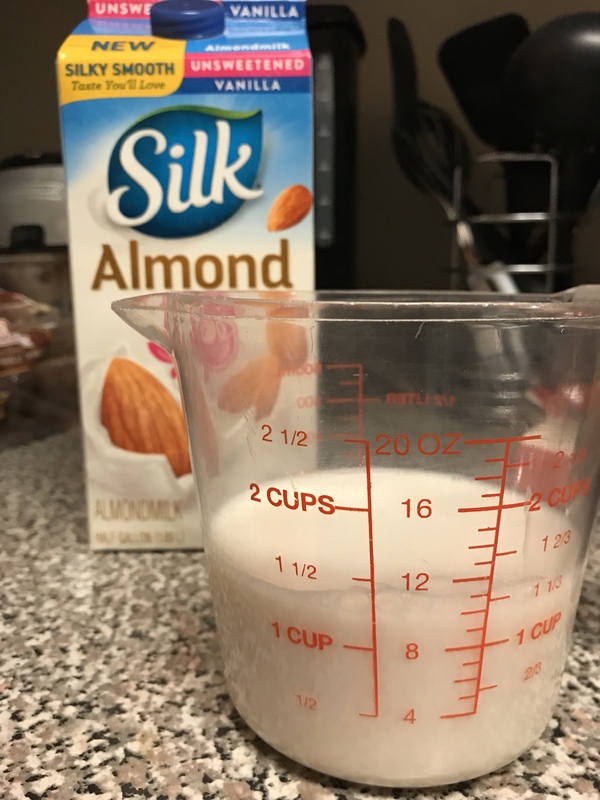 I used almond milk, but I have used cashew milk before. 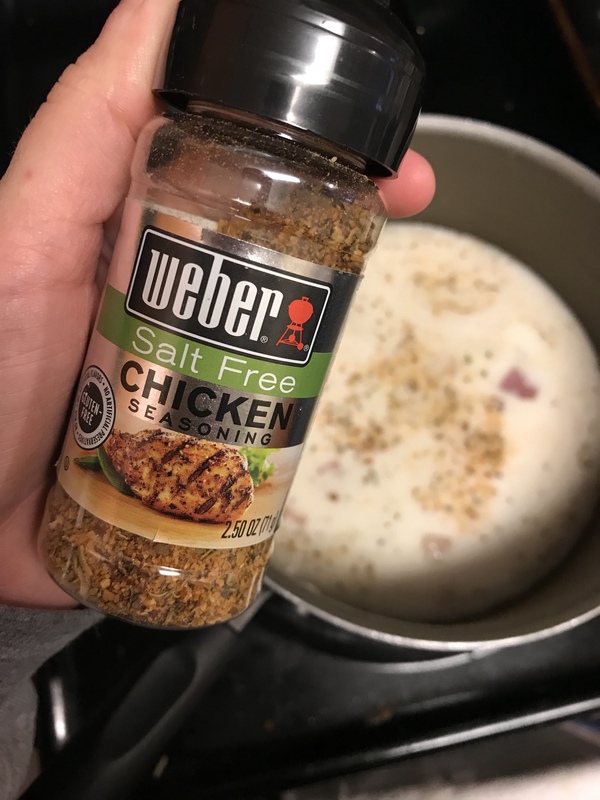 8.Add 1 cup of water with 1 teaspoon of salt free chicken seasoning – I did this as a chicken broth alternative because I was out. I’ve made it with 1 cup of chicken broth, you could also use 1 cup of water with a bouillon cube. If you want this to be completely vegetarian, you can also use vegetable stock. 9.With a whisk, mix ingredients well and top with a lid and let simmer on low heat until broccoli is finished roasting. 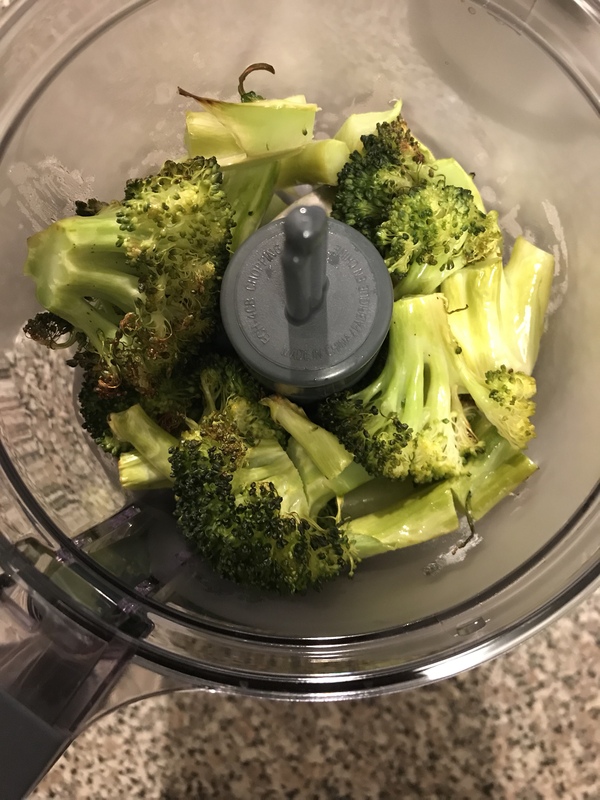 10.Once broccoli is down roasting, you have two options – chop in a food processor and then add to the pot or add directly to the pot. I’ve done both. 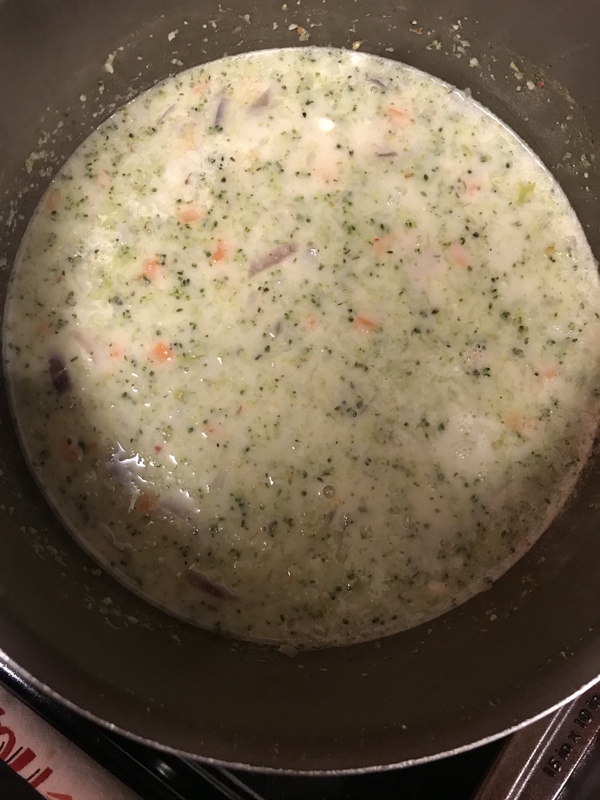 With the broccoli chopped fine, the soup become thicker on it’s own while with the whole broccoli it’s more soup and may need a thickening agent. 11.If you prefer a more soupy broccoli cheddar soup you can skip this step: After you’ve added the broccoli to the pot, remove a little bit of the liquid into a small cup or bowl and then add 1 tablespoon of flour to create a paste. Mixing the flour in a small amount of liquid allows for it to be combined thoroughly and prevents clumping. Add the paste to the pot and whisk thoroughly. 12.Lastly, add your cheese. I used a shredded cheddar jack and used about a 1/4 cup. 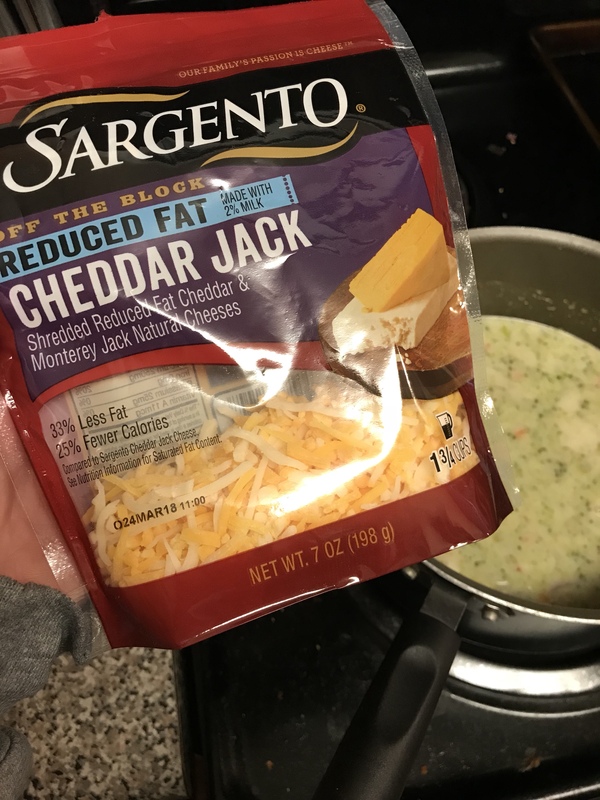 You can use more, you could also use a different cheese blend. 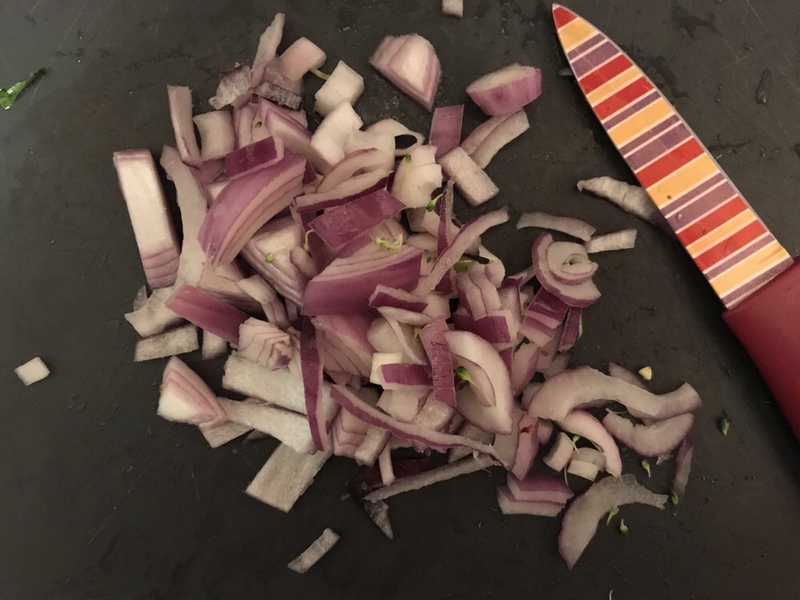 Peel red onion, chop in half and add to food processor until chopped. In a medium pot, add butter and red onion. Cook on medium heat until softened. 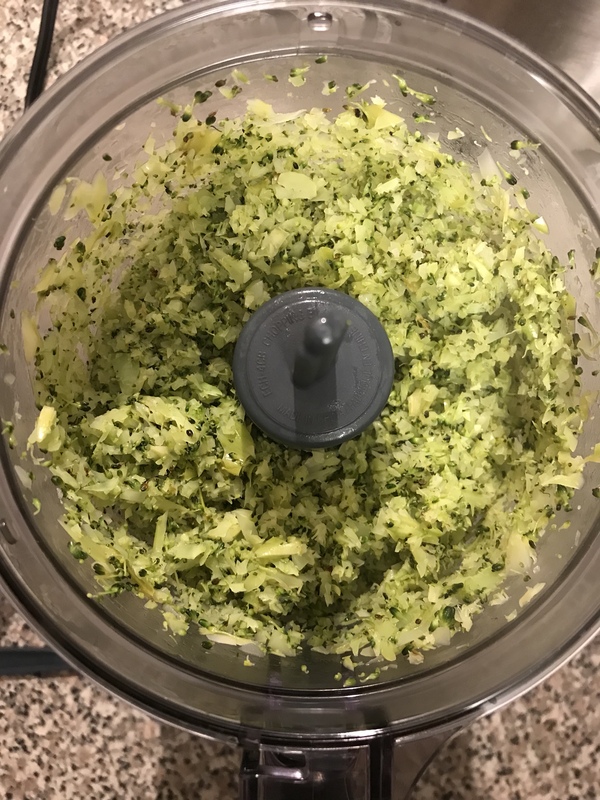 Add broccoli florets to food processor, it’s ok to have some chunks, this is going to be based on preference. Add broccoli to pot with onion and butter. Add milk and chicken broth to pot and cover until boiling. Once the pot has started to boil, uncover and lower heat from medium to low-medium. Remove about 1/4 cup of broth and add to a small bowl. 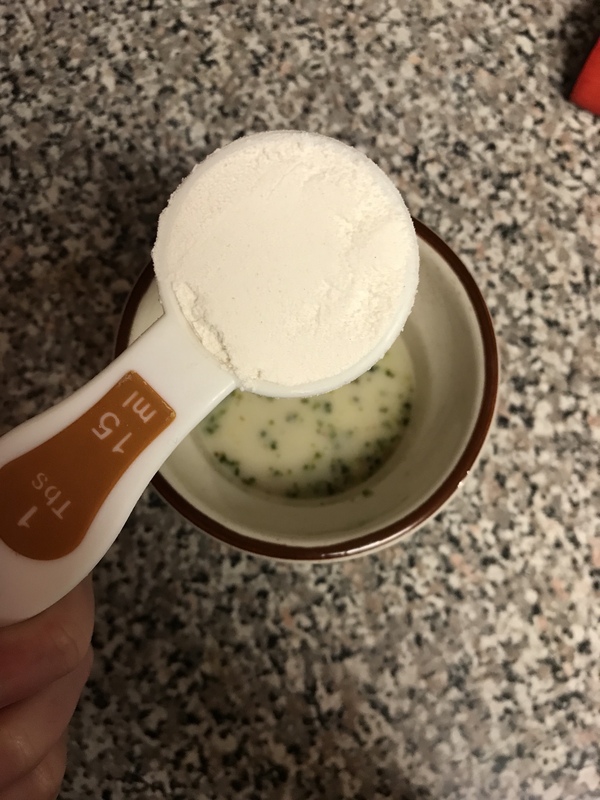 Mix with 3 tablespoons of flour until you’ve made a paste. Add this back to the pot and incorporate thoroughly.